Virtually every one of the 150 hands in Wisconsin Congressman Paul Ryan’s Thursday town hall meeting shot into the air. All day, Ryan had been peppered with questions about Republican presidential candidate Herman Cain’s economic plan, which replaces the current federal tax structure with a 9 percent personal-income tax, a 9 percent corporate-income tax, and a 9 percent federal sales tax. Milwaukee radio talk show host Charlie Sykes began the questioning in the morning. Ryan, the House Budget Committee chairman, answered another gauntlet of questions about 9-9-9 in a morning town hall meeting in Muskego. And now the residents of Oak Creek wanted to see if the plan had earned the imprimatur of Congress’ premier fiscal wonk. Ironically, it was Ryan himself who took to the road last April to promote his own budget plan, which had recently passed through the House of Representatives. All across America, members of Congress were challenged on the details of Ryan’s budget at their town hall meetings. And many had trouble navigating their avalanche of charts and graphs with Ryan’s legendary alacrity. Now, he was being forced to explain someone else’s plan in the same way others had to defend his House budget in April. Critics of 9-9-9 believe the plan’s regressivity render it dead in the water. (Cain addresses this problem in part by offering tax rebates to low income individuals.) They say the plan constitutes a large tax break for the rich, that it won’t raise the revenue it promises, and that it creates new taxes that Congress could more easily raise in the near future. Ryan’s association with 9-9-9 began last week, when a headline in the Daily Caller breathlessly declared that “Paul Ryan ‘loves’ the idea of Herman Cain’s tax plan.” Ryan says the article didn’t get his position on Cain’s plan exactly right – while he “loves” the idea of candidates putting bold plans on the table, he wouldn’t sign on to all the details of 9-9-9. Specifically, he disagrees with layering a nine percent sales tax on top of a nine percent income tax, as many governments in Europe do. When asked whether he thinks Cain’s numbers add up, Ryan says that while the plan hasn’t been officially “scored,” he believes it more or less raises enough money. “As someone who has been criticized for putting out a bold plan, I can understand what it’s like,” Ryan told me in between town hall meetings, adding that picking apart Cain’s plan was the job of the other presidential primary candidates, not his. Other candidates are slated to roll out their economic plans over the next few weeks. 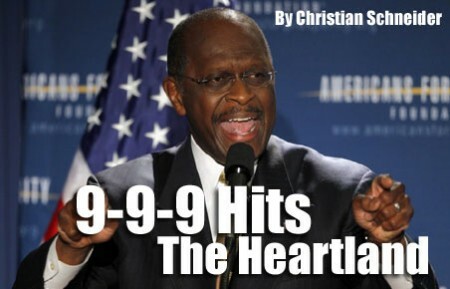 But few will get the traction that Herman Cain has garnered through showmanship alone. It will be seen as to whether he can cash this goodwill into votes.